In June I had the good fortune of being a part of an incredible, awe-inspiring experience. And with some of the most important people in my life, asides my children. Three of us, all business owners, victims of a busy lifestyle, managed to work our demanding schedules to coincide to take a trip up to the Western Isles of Scotland. The journey would see us depart from Birmingham on a short flight to Glasgow, and within an hour of landing begin to work our way through the stunning landscapes around Loch Lomond, and West to embark the ferry at Kennacraig. 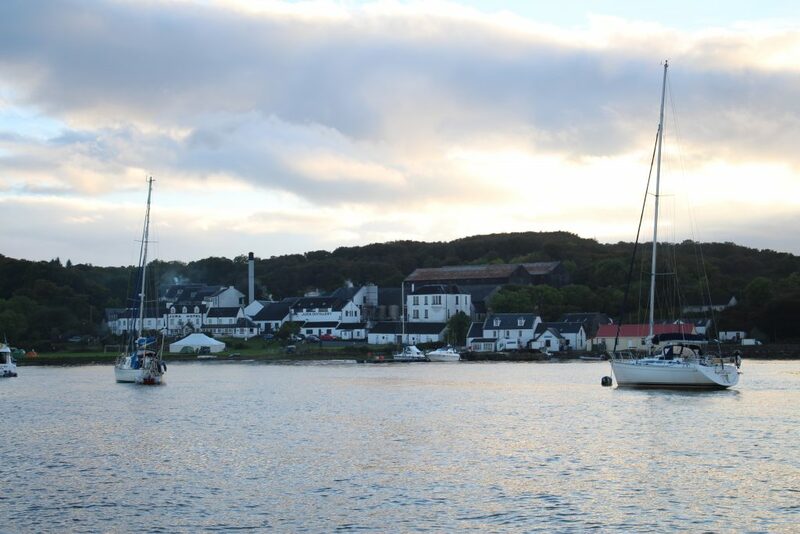 Our destination: the Queen of the Hebrides – Islay. That magical place, world renowned for its beautiful hills, extensive fields of peat bogs, and that luscious golden commodity – whisky. 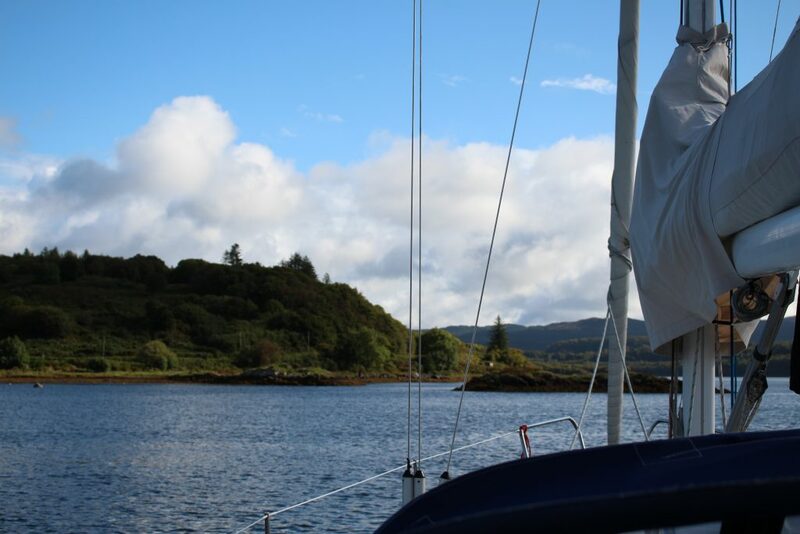 Our loosely formed plan was to spend some time on the Island and then join our team friend Mark, and Skipper, Laurie, on sailing yacht Bluebird for an adventure into the sea just South of Islay. Now, I have to say, not one of the three of us had ever sailed before, and we climbed aboard with excitement and a little trepidation. Laurie and Mark were quick to get us settled, guide us through the safety briefing and ease us into the experience. Within a short time, we were pulling at ropes, winding winches and steering Bluebird out of the port. Fair weather and a good Easterly wind got us on our way heading up the Sound of Jura, and Laurie took each of us under his wing to impart a fraction of his 55 year wealth of knowledge of the local seas, landscapes and sailing techniques. The views across to the intricate landscapes from the boat are breathtaking, and coursing through the waves at upwards of 6.5 knots with nothing but the wind and the comforting experience of our Skipper behind our sails, the experience was nothing short of breathtaking. Within a few hours of plain sailing we were steering our way into Craighouse on the Isle of Jura, and taking a shore visit to use the telephone, a commodity we had not missed while at sea. On our return into the cool evening, we were greeted by the warming aroma of cooking. Laurie had whipped up a delicious chicken casserole, fit for a king. It turns out that as well as a very competent sailor, Laurie had run his own successful restaurant and is no stranger to the kitchen. A few glasses of wine and we were soon sound asleep after our day of sailing for a good night’s rest before we headed off down the island to travel back to Islay. I’m not sure what each of us expected as we casually found our way, but what we discovered was that there was no shortage of good grace, kindness and patience in everyone we met, a kind of peaceful contentment that exuded comfort and welcoming hospitality that eased us into our break from work. We had embarked on this journey to find whisky, a little bit of peace and quiet, and a story or two to take home with us. What we found was a place that touched us deeply, people that we could call friends, and experiences that would leave a lasting impression in our souls. -Recount from a customer from their sail on Bluebird 2017.